TCB has entered into a collaboration with Vogue Netherlands in order to actively pursue the upper segment of the leisure market in the Netherlands. Vogue was so enthusiastic about the collaboration that the magazine decided to send an international production team to Bonaire and to book the Dutch top model Romee Strijd for the production. An exceptional collaboration with a tourism agency that received a lot of positive attention in the press (Antilliaans Dagblad, Travelpro, Trav magazine, etc.). Vogue has a circulation of nearly 70,000 printed copies (284,000 readers) and a high online reach: 500,000 unique visitors, 133,000 Facebook fans, 22,000 newsletter subscribers, 77,000 Twitter followers and 83,000 Instagram followers. TCB-Europe is developing a large-scale, integrated marketing campaign that will give Bonaire ongoing attention in Vogue magazine and enable Bonaire to expand its target audience and also give TCB-Europe the opportunity to develop a wide range of promotions for both consumers and business-to-business partners. 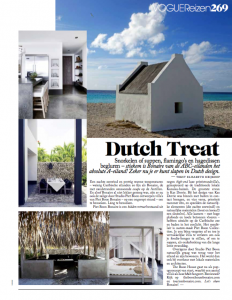 Everything that was covered during their stay on Bonaire will be seen in the different editions of Vogue Netherlands (March through October 2016), so we can approach Dutch tourists and our trade partners with enticing Bonaire information and promotions.